I met Rochus Misch in March 2007. He was an energetic old man, living at a quiet, insignificant Berlin suburb. For his neighbours he was just Rochus. For the rest of the world he was Hitler’s bodyguard and the last survivor from Hitler’s Bunker below the German Chancellery building. I read a couple of hours ago that he died today and spent some time thinking about my acquaintance with him. I interviewed Rochus for more than 4 hours, it was my first “serious” interview and I wanted to get all the facts straight. 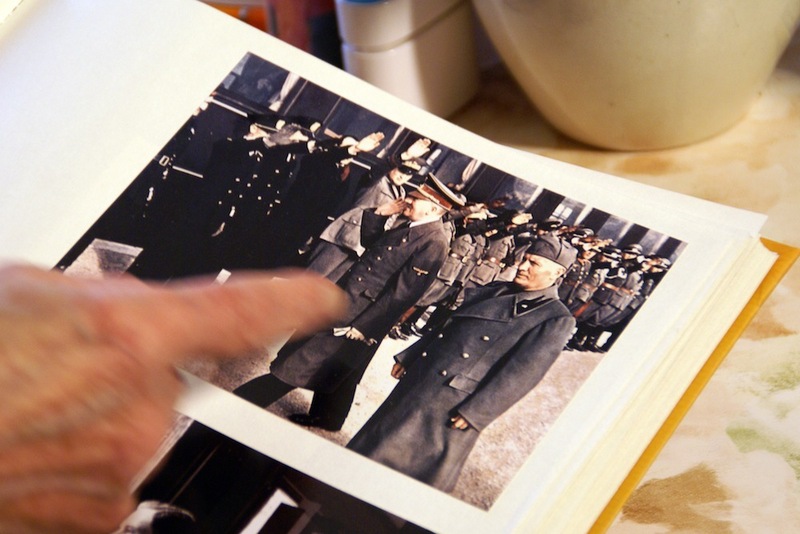 Rochus narrated tons of details from his life and his service under Hitler’s direct commands. The inevitable questions were posed. Rochus kept telling me that he didn’t know about the Final Solution. He was Hitler’s shadow, but old Adolf never went to concentration camps, hence Rochus never saw anything. 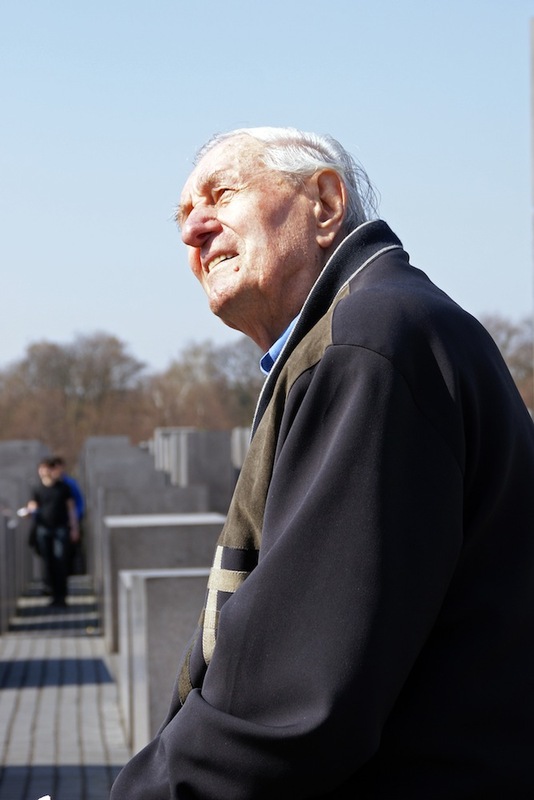 I asked him to conduct a part of the interview at the Holocaust Memorial in Berlin; he had no problem at all, sitting on one of those eerie concrete blocks talking to me about his duties, his service. Rochus was orphaned at an early age and, after trying his skills as a painter, he joined the army. He was a very simple boy who was discovering the world and the offer to serve in Hitler’s bodyguards came completely out of the blue. Suddenly, from a village boy in uniform that he was, Rochus was transformed into the bodyguard one of the world’s most powerful men. Even when I met him, six decades later, I could feel his awe when he was talking about the “boss”. But still, I’d ask the same question again, in other words every time, and he would deny that he knew, he’d try to avoid denouncing the killings, “there is no war without crimes and there will never be one” he kept saying. Why wouldn’t he just denounce the Holocaust? I kept wondering during the week I was in Berlin. Was he a fascist? No he wasn’t. He was an insignificant boy who suddenly became significant. His life got meaning under Hitler. He could easily deny everything else apart from the importance of those few years he lived next to Adolf. I remember him being extremely reluctant of talking about his family. I later found out that he had little or no contact with his own daughter. She had found out from her maternal grandmother that her mother (Rochus’ wife) had Jewish origin, something that he never accepted. 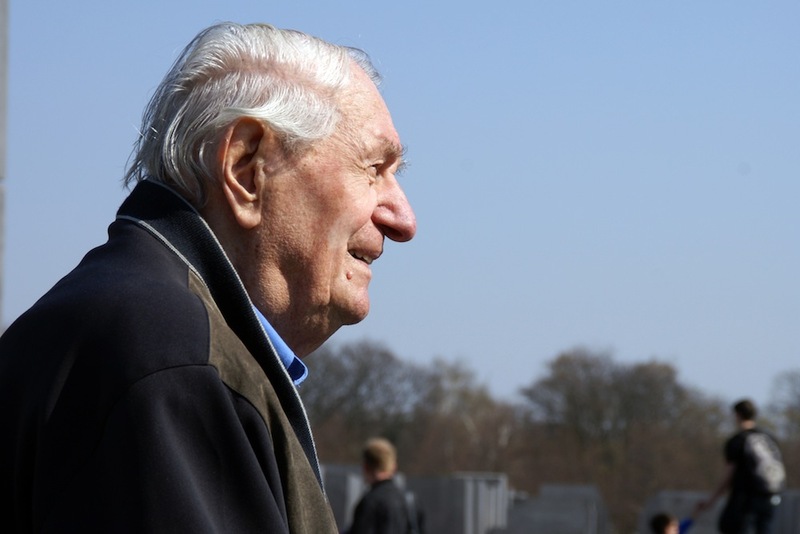 After the war Rochus spent nine years in Soviet camps as a prisoner. He returned to Berlin and had a quiet life after that, much like his younger years. 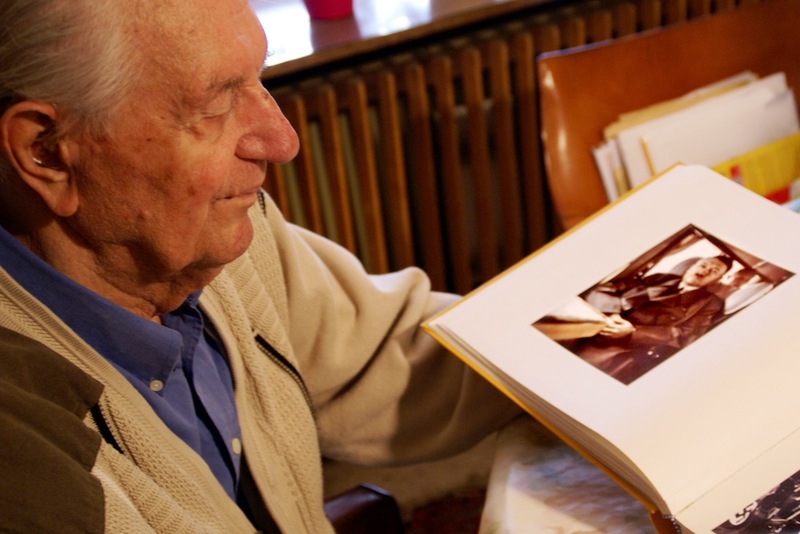 When I met him in his 80s, Nazi Germany was the most vivid, most important part of his life. He wouldn’t get tired of giving interviews to journalists from all around the world, asking him the same things. How was it in the bunker? Did you hear the gunshot when Hitler and Eva committed suicide? Did you see Magda Goebbels poisoning her own children? How did you feel? I am now thinking about Greece. And the rise of the extreme far-right over here. I think of the countless Golden Dawn voters that I have interviewed. Most of them are marginalised. They feel important when they participate in Golden Dawn rallies. They belong somewhere. Much like Rochus. They deny any connection between Golden Dawn and the rise in racist attacks in Greece. We didn’t see, we didn’t hear, if this is true it’s bad but we are not sure yet. Much like Rochus. And they keep supporting them. They turn a blind eye to violence, to populism, to hatred, to intolerance, to social division. And, most importantly, they vote for them. Insignificant men doing significant (but wrong) things. 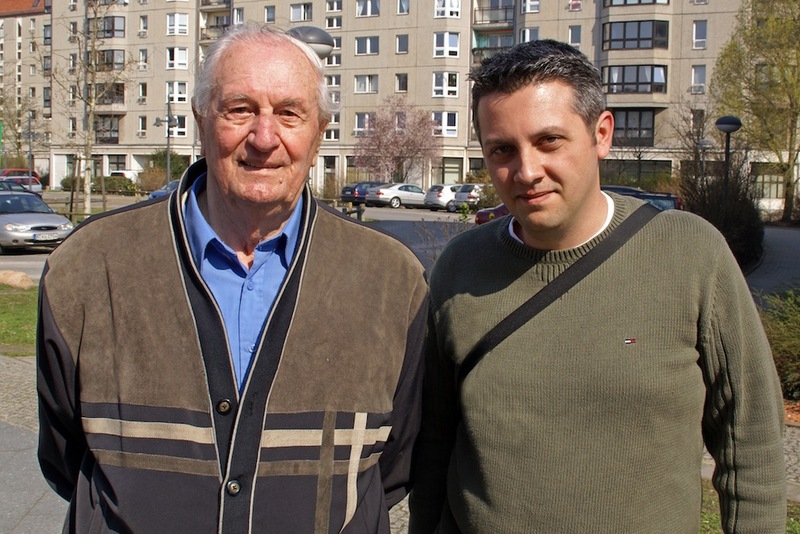 PS: I had travelled to Berlin for the production of a documentary about Rochus Misch for WarZone Documentaries where I was working back then. 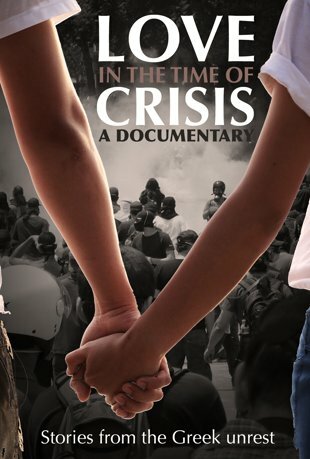 The documentary is available online here (unfortunately only in Greek). This is a great example if you want to see how a responsible Greek politician behaves in times of crisis. In May 2010, when Greece was about sign the IMF/EU/ECB Memorandum, Michalis Chrysochoidis was not just another Socialist MP but the Minister for Citizen Protection (one of the high profile government posts). Yesterday he was invited to talk to a news program at SKAI TV. The discussion was around a recent criticism on the terms of the Memorandum, highlighted by former Prime Minister Kostas Simitis’ speech at a conference in Berlin. This is the video excerpt from SKAI TV and below a quick translation. Journalist: Let me ask you directly. How many hours did it take you to read the Memorandum? Because Mrs [Louka] Katseli (the then Minister for the Economy, Competitiveness and Shipping) said yesterday that she was given the Memorandum on Saturday night and spent two hours on reading it and this is how she went to vote on it. Have you read what the creditors have written down and did you have a different opinion than theirs? Were you aware of what you were about to sign? Journalists: Excuse Mr. Minister, this is very serious. How did you sign it? Did you sign a text that commits the country for an eternity and that is responsible for the mess in which we are now and you are telling us that you didn’t read it? How can you say this so easily? Chrysochoidis: Look, in politics things are not like that. Chrysochoidis: Some of my colleagues had negotiated, some of the responsible members which represented the government had negotiated and brought that legislation into the Parliament and, as you remember, it was voted by the majority of the Parliament, by PASOK and LAOS if I remember well. Journalist: Is there a direct responsibility on the economic staff of the then government [i.e. the Minister of Finance George Papaconstantinou]? Chrysochoidis: As I told you before, it was done so under a state of panic in view of a possible suspension of payments which was a threat over our head. My job at that time was to re-organize the Police, the Fire Brigade, to create the DIAS team [a Police group which patrols in motorbikes], to fight crime. It was not my job to study the Memorandum. So Mr. Chrysochoidis just said that he signed one of the most important legislation passed in this country without even reading it. He just went the next day to the Parliament and voted for it like an amateur politician. Like a virgin! He didn’t have the time because he was re-organizing the Police which indeed showed a great zeal to crush the demonstrations taking place in the center of Athens. It was the same days when three people were burned in the fire of Marfin Bank, a collateral damage of that day’s violent chaos. The DIAS team were roaming the streets like horses of the Apocalypse, attacking protesters. And yes, crime, there wasn’t much of it that day because the political head of the Police devoted all his time on the issue rather than having a look at the Memorandum. Some key things to note which will make some (more) sense. There is a widespread criticism on the terms of the Memorandum even by PASOK MPs, now that the old PASOK (that of George Papandreou) is crumbling. Everyone one is trying to clear his/her name, to distance themselves from the shame of “having been part of it”, preparing for the next day, or simply for the coming elections. Let’s not forget that Mr. Chrysochoidis has declared that he intends to challenge for the PASOK leadership which will be decided very soon. But let’s not be in a hurry and put all the blame to Chrysochoidis for simply telling us the truth. Most, if not all, of the MPs had literally a few hours to read the Memorandum. Among the virgins, there were some prostitutes too. Here’s an excerpt from an older post that I’ve wrote (The run up to the Greek economic crisis) – it is a translation by an article of To Vima’s journalist Pavlos Papadopoulos. “We were like prostitutes after their first time” a top government official confessed in his attempt to describe the Cabinet member’s psychological situation during their meeting to sign the Memorandum, on the 5th of May 2010. “We were looking at each other and we were all pale” he says. “We felt very ashamed since we couldn’t believe that we, PASOK, led Greece to the IMF, having chopped the salaries and the pensions”. And then he concludes “Since then we have been completely prostituted. We’ve done the same things over and over again without feeling any shame”. Almost all PASOK politicians admit in private that the Memorandum, despite its provision of some necessary reforms, is synonymous at the same time with the sentencing of the economy to a prolonged depression and with the mortgaging of the country to its lenders. However they recognize that it was the last choice in order to avoid bankruptcy and to secure the savings and the pensions, especially since the government had previously failed to implement the prior solutions. “The Memorandum was hastily written by us and the troika” admits a high-ranking government official who participated in the (so-called) negotiations. “We had no idea of what we were writing and the troika experts were equally confused, working under great pressure from the European Commission and the IMF”. According to first hand accounts, the slightest preparation hasn’t been made and simply, on the last moment, they isolated part from older IMF Memorandums as those with Turkey, Mexico or Hungary and they would hurriedly adapt them to form the Greek Memorandum. “It’s a bad compilation, a Frankestein-styled Memorandum” says a Minister who admitted that he had less than three hours to read, understand, evaluate and approve the part of the agreement which would commit his Ministry for the next four years. Obviously this Minister was not Chrysochoidis. Michalis Chrysochoidis is currently Minister for Development, Competitiveness and Shipping. This is how the vice-president of the Greek government, Theodoros Pangalos, was received in Berlin by local Greek activists (of the Real Democracy movement). The banner stated support for the 400 strikers of Hellenic Halyvourgia steel industry. They’ve been on strike for about two months, one of the biggest labor actions for decades. The strike has been greatly underreported in the Greek media, causing concern and suspicion. The murmurs about Barack Obama being forced out began in Berlin and Beijing. After his party lost the midterm vote, there were hints that a government of technocrats would be imposed on America, to save the country from a debt crisis and the world from a depression. As the debt-ceiling negotiations stalled out over the summer, a global coalition — led by Germany, China and the International Monetary Fund — began working behind the scenes to ease Obama out of the White House. The credit downgrade was the final blow: the president had lost the confidence of the world’s shadow government, and his administration could no longer survive. FOR Americans, the scenario that New York Times columnist Ross Douthat just imagined is a paranoid fantasy, the kind of New World Order nightmare that haunts the sleep of black-helicopter watchers and Trilateral Commission obsessives. But for the inhabitants of Italy and Greece, who have just watched democratically elected governments toppled by pressure from financiers, European Union bureaucrats and foreign heads of state, it evokes the cold reality of 21st-century politics. To read the whole article click here. This is the 2nd part of Greek journalist Pavlos Papadopoulos’ article on the run-up to the current Greek economic crisis, published by “To Vima” newspaper (16/10/2011). To read the first part of the article, click here. “George knew everything” admits to “Sunday’s Vima” newspaper a top government official. “Since February 2009, eight months before the elections, we knew that Greece was technically bankrupt. The actual bankruptcy was a matter of time”. In February 2009, there was a sudden increase in the difference of the interest rate (spread) between the Greek and the German state 10-year bond. That development, which panicked the Karamanlis administration, didn’t go unnoticed by the PASOK leader and his close associates. After talking with Greek and mostly foreign experts (Economics Nobel Prize recipient Joseph Stiglitz and investor George Soros, to name but a few) Mr. Papandreou is said to have concluded that the dynamics of the public debt was so powerful that a catastrophic bankruptcy was certain. According to the same source, the PASOK chairman then thought the obvious thing: the states which are on the verge of bankruptcy address to the International Monetary Fund (IMF). However he realized that the capital which was necessary for Greece to avoid bankruptcy was five times more than what the IMF could offer. So he concluded that Greece needs an “international solution” and he started examining the initiatives that he could take. “Our mistake was that we didn’t prepare the people” says the same party member, “and the Party either”. Mr. Papandreou underestimated the “domestic front” even though he knew that Greece was heading towards bankruptcy. He didn’t abandon his vision of “Green Development”, neither did he direct his Financial advisors to more “careful” declarations. In the summer of 2009, the total cost for benefits was 30 bn euros. A lot of the MPs have called 2009 as the “new ‘81”. Mr Papandreou stubbornly insisted in a vague rhetoric. He reckoned that a combination of green development, institutional reforms and a (completely unspecified) international initiative would solve the debt problem without targeting the people. This is why the warning by George Provopoulos, Governor of the Bank of Greece, that the 2009 deficit would be a double digit figure didn’t mean much for the wannabe Prime Minister. What he actually believed was that Greece would go from over-borrowing to prosperity without walking the distance in between. And some accused him that, had he taken tough measures back then, he could have avoided the worse that followed. There was no “socialist allergy” at the Finance Ministry when it came to austerity measures. The Minister often called confidential meetings. “Think of shock measures” was his request to his associates . He believed that the austerity measures were necessary to restore the international markets’ trust. One of his most radical and risky ideas that was heard in those meetings was the “10% haircut of the savings” for all the bank accounts which had more than 100.000 euros. They would implement it at the same time with the (French inspired) freezing of any account which would be instructed to send more than 100.000 euros abroad, in order to proceed to a tax details check. These proposals, as many others, were triumphantly rejected. Mr. Papaconstantinou did not possess the political prowess to enforce a different policy, while he never recovered the control over the tax-collecting mechanisms. He was good enough abroad. Domestically he achieved the minimum while he didn’t avoid deficiencies and the equivocations which increased the insecurity and the uncertainty. The measures that were announced were like aspirins and even them were causing reactions. Like the reaction by Christos Papoutsis when they announced the freezing of salaries in the public sector for those whose paycheck was more than 2.000 euros (which was rejected by the Prime Minister too). During the early period of his administration Mr. Papandreou visited Moscow and Paris in order to “surround” Berlin, since Angela Merkel didn’t want to accept, especially after her alliance with the Liberals, a “European solution” in co-operation with the IMF. Mr. Papandreou reckoned that, if he could convince Moscow and Paris, he could then take Berlin. Having his mind in an “international solution” he kindly avoided Vladimir Putin’s proposal of geopolitical significance for an interstate loan to Greece. While waiting for the international solution to mature, it was preferred to flirt with Goldman Sachs and Deutsche Bank. According to banking sector sources, the Greek government appointed these two banks at the same time with the order to investigate the possibility of a 25 bn euros loan (private placement) from the markets. However the international practice necessitates that such orders are given only to financial institutions. At the end of 2009 Gary Cohn, CEO of Goldman Sachs, met Papandreou at the Pentelikon hotel in Kifissia suburb. At the beginning of 2010 the head of Deutsche Bank, Josef Ackermann, visited the Greek Prime Minister’s office. The players who were involved in these initiatives were having preferential access to the core of power. The initiatives failed. The two banks (and their middlemen) lost important commissions. And the markets’ lack of trust against the Greek government increased. End of Part 2 – To read Part 3 click here.